Microsoft might be ready to offer Windows 10 as a free download to certain customers later this year, but the company still has plans to make plenty of money off of its most important product. In addition to enterprise customers that’ll have to pay for the upgrade to Windows 10, the company might also have a different kind of Windows product in mind, one that will have a subscription business model like Office 365. The term Windows 365 has been listed in various leaks detailing some of Microsoft’s plans for the future, with people speculating that the company is interested in bringing the Office 365 model to Windows in the future. 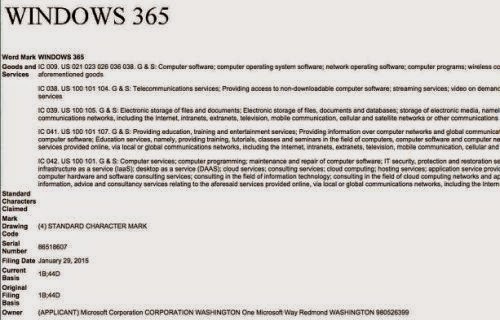 It looks like the marketing name is definitely genuine, Neowin reports, as the company has applied for a Windows 365 trademark. However, it’s not clear what the company plans to do with Windows 365 in the future, and the publication says Microsoft might be simply taking defensive action for the time being, looking to protect this particular trademark for the future. More details about Microsoft’s Windows 365 application is available at this link.